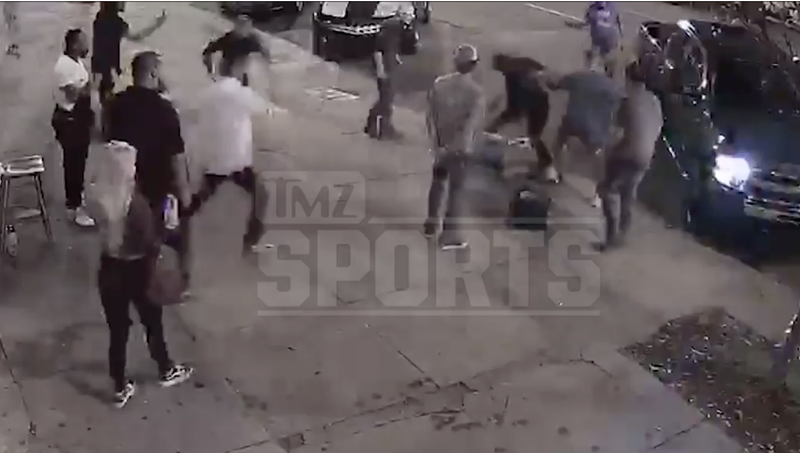 Footage from a security camera caught Carolina Panthers guard Taylor Hearn getting knocked out cold while fighting someone who clearly did not match his 6-foot-4-inch frame or was anywhere near the lineman’s listed weight at 315 lbs. Hearn appears to get into it with a significantly smaller dude and even manages to get a few punches in as people try to separate the two. Once the hits landed, however, a fight erupted between the two. Hearn appeared to have everything under control until another guy stepped in and started fighting on the original guy’s side. The new dude then caught him right in the face and the lineman dropped hard to the street. Hearn was apparently okay afterwards, and even tried to start fighting the guy again moments later. Cops arrived shortly after the video ended and no one was arrested, according to TMZ. Hearn started for Clemson’s 2016 National Championship team and played four games for the Panthers this past season. It’s worth noting that Cam Newton was sacked five times in the two games Hearn was tasked with protecting the quarterback.